Major League Soccer's version of los Galacticos, the LA Galaxy, finally managed a winning season with Beckham, and went further, reaching the MLS Cup final. This season expectations will surely be even higher. 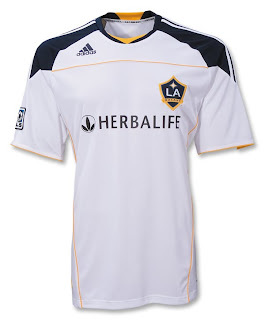 Official adidas Los Angeles Galaxy MLS 10/11 Home Soccer Jersey! For style, the redesigned jersey has futuristic epaulet-like trim over the shoulders with undulating lines running down the sides. For performance, it's made from adidas ClimaLite® - Soft, breathable fabric used to wick moisture away from the skin, thereby keeping you drier and more comfortable, when you play or support your favorite MLS soccer team!